Great photos, - perfect post for the theme! I love your colorful little sparrows for the day! What fun captures, Karen! Hope you have a great day! 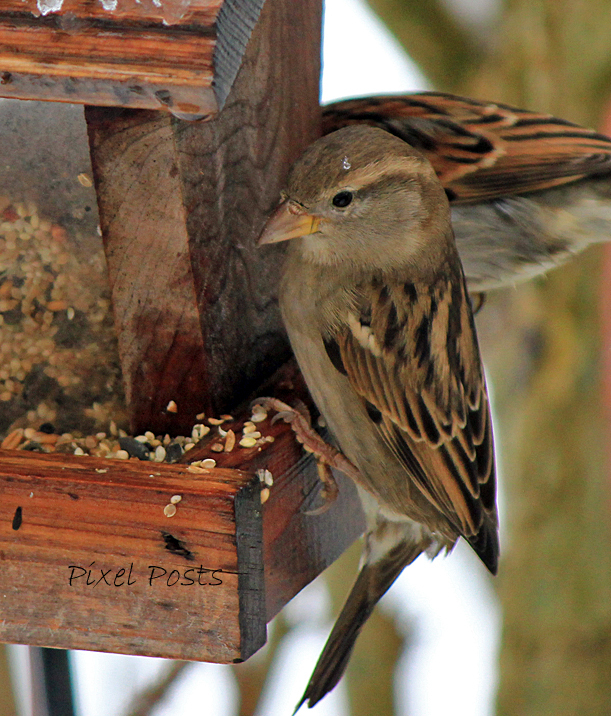 Great photos of the sparrows, almost macro! See you have snow, we lost ours new years day! Great close-up photos of the sparrows. Great capture of lovely sparrows! ooohhh you are getting GREAT visitors!! Great shots of the sparrows. To answer your question on my ABC post, no way did I try it because I threw peppers and curcumin and coriander seeds and I can't remember what else in there. Everything bright and with different textures once I crushed them together but not a mixture fit to be eaten. The birds do seem to enjoy the feeders during the winter. Great captures! Wow! great sightings! Sparrows are so rare in my part of the city. These close-up photographs are terrific. Beautiful shots of the House Sparrows Karen! Sparrows mob my feeder also. Nice pictures - even if they are not as good looking as some birds, I rather like sparrows. the invasion of the seed bandits!! Lovely! I love to see the sparrows. What a terrific shot. My post today is a bird (heron) too. YOu know, I like this bird BUT...I have to tell ya I like the detail of the seed in the photos even better...just adds such interesting texture to the composition. Great job. Hungry birdies! they need those calories in the cold weather. Lovely bird shots....i like them Karen. o, but they are nice birds. You miss them when they are not around. Świetnie podglądałaś wróbelki w podajniku i mają śliczne zdjęcia. Pozdrawiam. You looked great on the sparrows in the tray and have beautiful pictures. Yours. They are very pretty though! for those who enjoy and want to share beautiful photography. Share your photos from the week and connect with other photogs. And be sure to sign up on our site to get an email notice when the next Photog Friday is live. 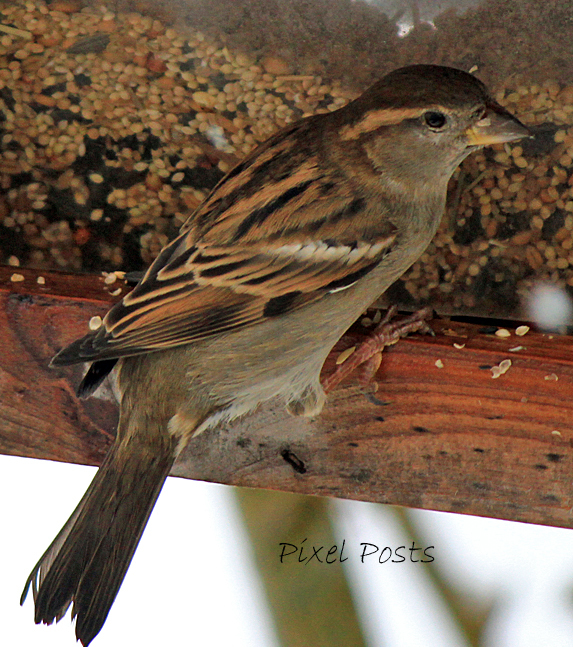 There certainly is no shortage of these little guys, nice pics of the sparrows. 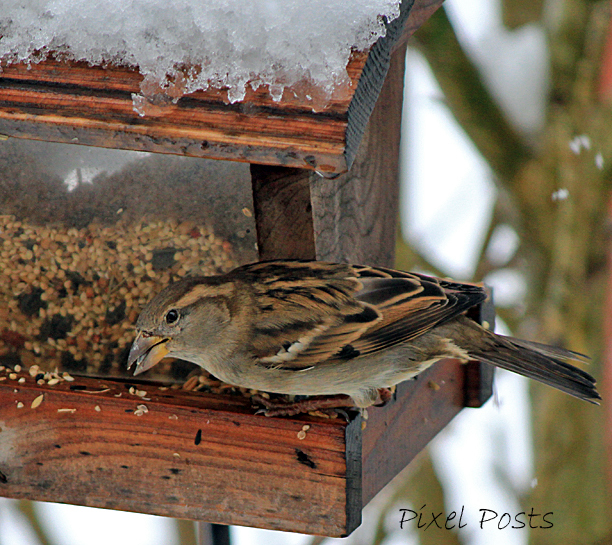 Sparrows and squirrels are always at my feeders, and they can eat a lot! I use a Canon Rebel T2i and a Canon SX210IS. I don't edit my photos much, other than cropping, and some sharpening. This is a word verification FREE blog. Back To Our Scheduled "Summer Program"
© Copyrighted Material under the Federal Copyright Act of Canada. All photos (Pixel Posts) presented on this blog are my original works, unless otherwise indicated.